The Reverend Vincent Gower-Jones was appointed as the new vicar of Caverswall in 1935. In the years that followed he became increasingly surprised by the fact that although the building was clearly ancient, no-one had written a history of St Peters Church. In 1944 he invited a Mr J.D. Johnstone to research the subject and produce a book. Mr Johnstone was a well known and respected local historian / archeologist and a promiment member of the North Staffs Field Club. Mr Johnstones book was published in 1948. In his list of acknowledgements he wrote that he had drawn freely and gratefully on the work of the late J.H. 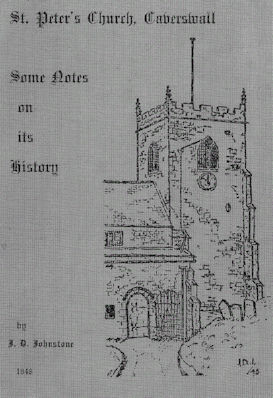 Beckett who had done much for the architectural study of churches in North Staffordshire. He also thanked Dr. G.R. Rigby for the use of his suggestions on the re-construction of the church and Mr T.E. Moore for his photographic illustrations. The book was printed by Mr G.E. Holmes at the “Times” Office, High Street Cheadle. It seems that the book had a limited production run and the copies were quickly snapped up by people eager to read about the history of their lovely old church. Many years ago my friend Gordon Ellis, loaned his copy to a man in the public-bar at the Red House, alas he is still waiting for it to be returned! I had almost given up hope of finding a copy when a chance inquiry to the website from Diana Green of Holsworthy in Devon saved the day. I am very greatful to Diana for the loan of her copy of Mr Johnstones work. The barrister and history writer Philip Guedalla famously wrote – “History repeats itself. Historians repeat each other.” If we could ask Mr Johnstone today I think he would recall the quotation with a smile. I have followed in his footsteps by drawing freely from his account of a history of St Peters Church together with some of my own research for this webpage. According to ‘A History Of Staffordshire’ by M.W. Greenslade and D.G. Stuart the earliest Anglo Saxons were pagans, the generally accepted date for the start of the conversion of the English to Christianity in Staffordshire is A.D. 653. ‘By the 11th century there were numerous churches in Staffordshire although Anglo-Saxon Christian remains in the county are few.’ We know that the manor at Caverswall existed in Anglo Saxon Times. This is because the Domesday Book of 1086 records the fact that a free man named Ulviet had previously owned the manor and that it was now owned by Robert de Stafford. Along with land, 10 villagers and 2 smallholders the contents of the manor included, a half of Stoke Church and half of a carucate of land at Stoke. Although the reason for the half share is not fully understood, it seems probable that the church at Stoke may have also served the people of Caverswall for a period of time. It is known that during the the 10th century manorial lords began the practice of errecting a small chapel on their land where local people could use the services of a priest. Historical records tell us that a William de Caverswall held the office of sheriff of the county in 1260 and again in 1269. There is also a record of a William de Caverswall applying for a licence to crenellate his manor house at Caverswall in 1275. 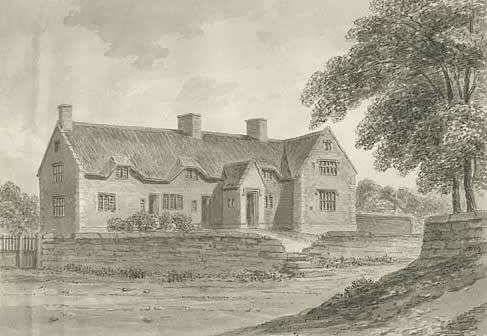 Around this time, William gave some land and houses in Caverswall to The Priory of St. Thomas at Stafford. He also gave the advowson of the church to the priory. A record within the Plea Rolls from the reign of Edward I (1272-1307) states that, William de Caverswall held the castle at Caverswall at the date of his death in 1292. 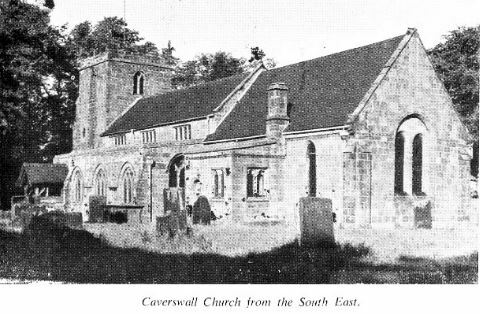 The ‘Staffordshire Incumbants and Parish Records 1530-1680’ compiled by Walter Landor includes a record of a R… persona Kaveriswalle who was the Rector of Caverswall in 1220. Taking account of the foregoing information, it seems probable that the original church would have been a wooden structure. The stone church was probably built by a Caverswall during the 13th century. J.D. Johnstone suggests that the original building consisted of nave and chancel and that there may also have been a south aisle. There is some evidence to support the theory that an earlier aisle existed before the present one. The north aisle was probably added in the 14th Century. When Matthew Cradock purchased the castle in the 17th century he arranged for repairs and rebuilding work to be carried out at the castle and the church. An entry in the parish registers records the fact that the church was rebuilt during the years 1628,1629 and 1630. Further improvement work was carried out around 1637 and a major restoration scheme was implemented in 1880. This image is from Mr Johnstones book. It shows a plan of the Church as it was prior to the 1880 restoration. The plan reveals some interesting aspects of the construction. Note the curious alignment of the western wall of the north isle with the wall of the tower and the alignment of the chancel with the nave and isles. There was a gallery over the western end of the nave which was reached by stairs inside the tower. The alter table is Jacobean and dated 1633. There is no piscina. Neither is there a reredos although plans to erect one were approved in 1880. The stalls were erected in memory of W. Aubrey Bowers of Caverswall Castle, who died of wounds in France in 1916. On the east wall are two boards on which the Decalogue, the Lord`s Prayer and the Creed are inscribed. 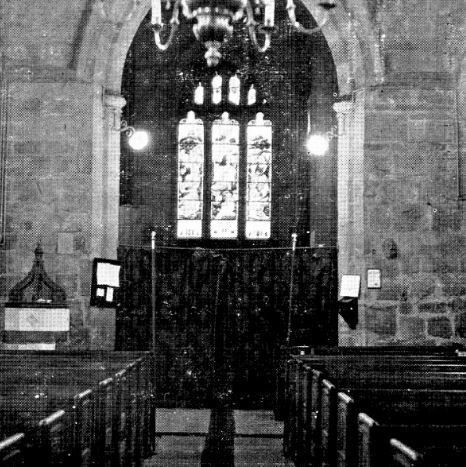 A chancel screen was removed in 1880 and replaced by the present arch. On each side of the nave is an arcade of five bays with round arches and a small one with a pointed arch. Matthew Cradock carried out rebuilding work between 1628 and 1630. It is thought that his chief aim was to improve the lighting of the church by inserting clerestory windows, but as the original arcades consisted of pointed arches there was insufficient room above them to do it. Consequently, to avoid the enormous task of increasing the height of the church, it was decided to replace the pointed arches by semi-circular ones. This involved dismantling the piers and re-errecting them a little closer together, thus reducing the width of the bays and leaving smaller spaces between each western pier and the tower. These spaces were bridged by miniature pointed arches. The responds of these arches, “angel” and “devil” are probably earlier than the re-construction period. The clerestory windows, three on each side, are square headed. The cylindrical piers are topped by capitals with scroll moulding in the early Decorated style. The repond at the east end of the north arcade, however, has the dog-tooth ornament, which is typical of Early English work. The north arcade is higher than the south, and the north capitals deeper than those on the south. The bases of the piers are probably Decorated work, except the east one on the north side, which is Early English. Until 1880 there was a gallery over the western part of the nave bounded by the first two piers on each side. Access to it was by a staircase in the tower. At this time, too, the nave and aisles were re-roofed. The Font was errected in 1831 and its cover is a memorial to W. Aubrey Bowers. The Benches are of oak with carved ends and panelled backs and were constructed from old box and family pews which were removed in 1880. Some of the panels are wrong way round ! Above the pulpit is a tattered bullet-riddled flag, which once flew from the mast of the S.S. Clarissa Radcliffe, one of the “victims” of a German submarine during the 1914-18 war. So severly was she damaged that the crew were ordered to abandon her. They refused to do so, and in spite of tremendous difficulties, kept her afloat and brought her safely to port. Why the flag is here no one knows ! On the north side of the nave high up near the chancel arch is a tablet to the memory of Edward Coyney of Weston Coyney (1772). Except for three windows this is the only Coyney memorial in the Church. The North Aisle has three windows in the main wall and one in the east. The latter and two of the northern windows are memorials to members of the Coyney family. The first from the door is in the Transitional or Early Decorated style and is similar to the three windows on the south side. (It is probably the work of the same mason for his “banker” mark can be seen on some of the exterior stones). The other two windows are examples of the flowing tracery of the Decorated style (14th century), and the east window is Perpendicular (15th century). Above the inside of the doorway, built into the wall, are portions of two sepulchral slabs or coffin lids, which probably belong to the 14th century, see Figs. 1 and 2 above. In the floor of the aisle are others, the designs on which are almost obliterated, but there is one better preserved than the others and is probably of 13th century origin, see Fig. 3 above. Built in the wall near to this slab is a stone with carving suggestive of plaited work and in the west wall are other carved stones near which is a grotesque stone head with a protuding tongue. The South Aisle is wider than the North Aisle and is trapezoidal in shape, the east end being wider than the west. In the south wall are three windows of Transitional or Early Decorated style. The most easterly is a memorial to W.E. Bowers of the Castle, and that in the east end to his wife. The west window of two lights with a quatrefoil in the head is probably a re-construction with 14th century materials. The aisle has a lean-to roof of old moulded timbers. Built in the wall of the arcade over the piers is a series of small corbel heads which, in all probability, carried an earlier roof. There is a large stone head on the south wall too. In the floor are three 18th century memorial slabs. The south doorway looks like Early English (13th Century) work but the door is similar to that in the north aisle. It bears the initials “T.S.” and the date 1637, but it is probably older. It is carried on metalwork hinges one of which has the inscription, “Richard Elston, Richard Tooth, Churchwardens.” This doorway is protected by a porch which was re-built in 1880. The Tower is Perpendicular and the west window is in the same style. It is a memorial to a former vicar, Rev. F.A. Goddard, and it was given by the parishioners in 1889. There are three stages in the tower but no stairway. Its height at the west end to the top of the parapet is forty three feet and six inches. The Belfry houses three bells dated 1500, 1743 and 1754. 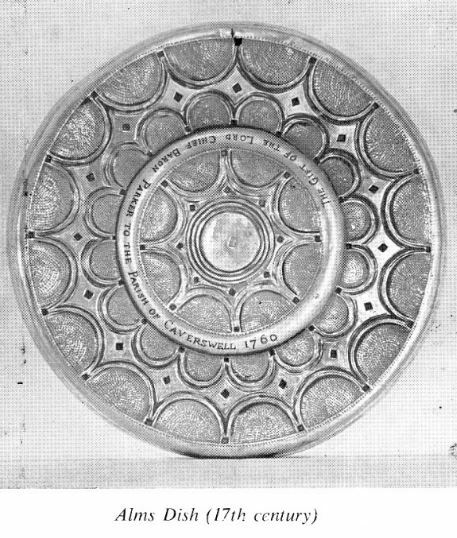 The oldest has a block letter inscription, “Ave Maria”; the next has inscribed the names of the Churchwardens, John Elkin and F Bagnall and also records that “Henry Bagley made me”; the third is inscribed, “Jeasus by our Speed; John Coyne gift, Thomas Hadderley, founder, 1754”. The two-light windows have forked mullions – imitations of the transitional windows in the south aisle. The image on the left is from Mr Johnstones book and shows the ground level of the tower and the west window. St. Peter`s is fortunate in its plate, which was the gift of Lord Chief Baron Parker in 1760. It is in silver gilt and consists of a flagon, paten and almsdish, all engraved with the Parker crest. The flagon and almsdish are equisite examples of hammered work. The latter bears the date 1628 and the initials T.T. 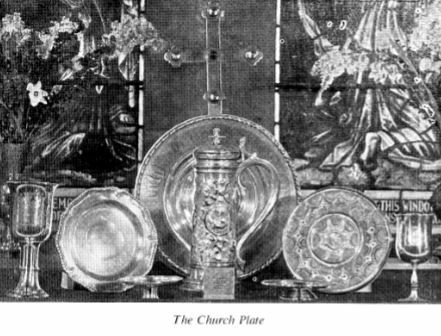 There is also a silver collecting plate which was presented by Samuel Wood of Adderley Green in 1760; a small pyx or bread box presented by Clarissa G. Veal in 1915; a large brass tray given in 1906 by the Caverswall Mothers` Meeting in memory of Alice Bowers; and a second chalice and paten of unknown origin. In the aisles are records of various bequests to the Vicar for the benefit of the poor of the parish or for himself in return for the preaching of special sermons. Joseph Wilshaw bequeathed £200 with instructions that it should be invested and the interest given every Christmas, to twenty (if there were that number) poor widows in money or bread. He also left £100 for the upkeep of his father`s tombstone and palisading. Harriet Parker left £200 in trust for the benefit of the poor for ever, and bequests for special sermons were made by John and Ralph Brown and by Bridgett Parker. The exterior of the Church is worth examining. Here and there are stones which bear small, geometrical designs chiselled by the masons who dressed them. Such designs are called “Masons` marks”. 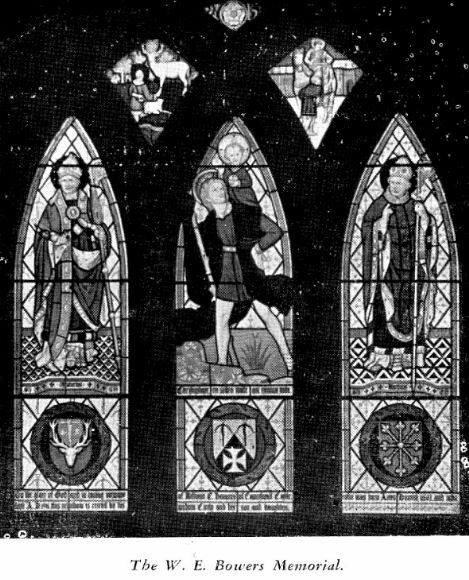 Present day masons have their own marks which are known as “banker marks” Examples can be seen on two of the south windows, on the window nearest the north door and elsewhere. On the south wall of the chancel is what appears to be the remains of a scratch dial, a primitive form of sundial used by medieval priests to indicate the “times” of services. In the hole, at right angles to the stone, was fitted a pointer, or gnomon, the shadows of which fell on different lines during the day. The important lines were those indicating nine, noon and three o`clock, the times of the chief services. The rays of this dial are evenly spaced, a characteristic of very early dials – 13th or 14th century. The Church Yard in mediaeval times was probably a meeting place and recreation ground, and rarely used for burials. It is unusual to find gravestones of earlier date than the 17th century. There are many interesting memorials to the parishioners of bygone days including, simple headstones, table tombs and obelisks. There is one of particular interest, on the east side near the road, which records the death of one Henry Plunket an ex-sergeant of the 8th Regiment of Foot, (the Kings Regiment) who, after 37 years of “servitude” obtained a pension of £40 per annum. He died in 1849 at the age of 55 years. Obviously one of Wellington`s soldiers, what gallant deeds did he perform to merit such liberality in those days ? Just over the western wall of the churchyard and on a lower level, is another burial ground with the graves of abbesses and nuns who died whilst their order was in residence at the castle between 1811 and 1850. Today it is cared for by members of a similar order who purchased the Castle in 1933. The long range of buildings on the south side of the church yard belonging to Dove House Farm, are well worth seeing, particularly that part which is said to have been a tithe barn. In 1538 Thomas Cromwell ordered each parish in England and Wales to keep a register of baptisms, marriages and burials. At first the practice was to use loose sheets and many of those have been lost or destroyed. In 1597 it was ordered that from the following year the records should be entered into a bound register and that older records should also be entered into the register. The Caverswall registers date from 1552, the first page is faded and torn and damaged through heat. One of the first entries records the fact that Thomas Coyne the son of Thomas Coyne (Coyney) was baptised in March 1553. The records for the years 1644-1661, the period of the Civil War and Protectorate are missing and there are gaps elsewhere. Besides recording births, deaths and marriages of parishioners they also record the names of many vicars, curates and churchwardens. The 16th century was a turbulent period for religion in England. Something like 300 years had passed since St Peters Church had been built and here in Caverswall, as with other parts of the country, the medieval Roman Catholic Church governed how people lived their lives and how they understood the world. The Church Services were conducted in Latin, and as only a few people could read, it meant that most people could not fully understand what was taking place. The emerging Protestant movement felt that the Bible should be printed in English and there were also objections to the Catholic practice of selling ‘induldgences.’ Although Protestant ideology started to appear in England in the early part of the century, King Henry VIII, continued to defend the faith and tried to destroy copies of English Bibles. The turning point came when the Pope refused to grant Henry VIII a divorce from his wife Catherine of Aragon. Henry responded by declaring himself to be the Supreme Head of the church in England. So began the split with Rome and the process of closing down the monasteries and convents. Following Henry`s death in 1547 his son, Edward VI, introduced a number of reforms. Church Services were now conducted in English and made easier for people to understand. Catholic images, icons and other goods and ornaments were removed from the churches, and the wearing of elaborate vestments by the clergy was discouraged. In 1552 the Kings Privy Council, mindful of the value of the church goods, plate, vestments etc, issued instructions for an inventory to be taken. The following is a list taken in respect of “Careswall”. Item A sacring bell, a cross of coper with a banor to the same. Item 2 sensors of brasse, on cruett, on towell. Item 2 vestements, on of blewe chamoler, thother of taffeta silk with all things thereto belonging, and a rochett. Item 2 coopes, on of redd silke, thother of checked crulle. Md. John Aston and Gilbert Rowley, Churchewardens there, delyvered to Richarde Forcett, surveor, on challes of silver, with a patent parcelgilte. Md. Edward Clarke delivered to Richarde Cowper, surveor, a vestment of whitte fustian with all things to hit and 36 shillings. Md. delyvered etc. to Edmond Clarke and Richard Hone. Churchewardens there, 2 belles in the stepull, a sanctus bell, 2 lynen clothes for the Holi Comunyon Table, and a surples for the ministre to menestre with. safely to be kept untill the kings Majesties pleasure be furder knowen &c.
The image on the right, and the one below, were not included in Mr Johnstone`s book. The original title seems to have been “Old Cottages Caverswall” drawn by John Buckler in 1840. The cottages are known today as the Church Terrace. The corner of the stone wall which can be seen on the right hand side of the drawing is a part of the wall around the churchyard. The cottages stand on the right hand side of the single track road leading to the village cemetery. The windows in the gable wall have been blocked up but the stone mullions can still be seen. 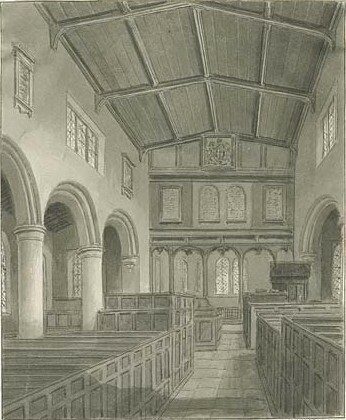 The drawing on the left, also by John Buckler, reveals how the interior of the church looked in 1844. The box pews, the Gallery and Pulpit were removed during the restoration work which was authorised by the Bishop of Lichfield in 1879. 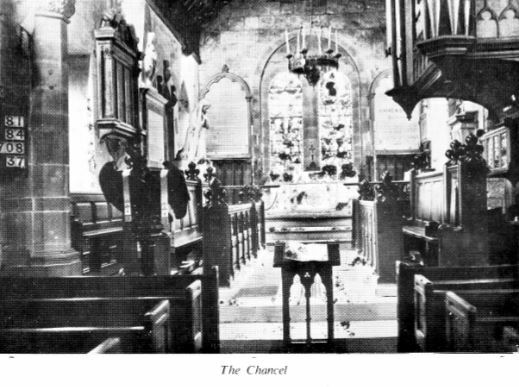 The pews were replaced with the oak benches that can be seen today. The chancel screen was also removed during the restoration. The boards bearing the Decalogue, the Lord`s Prayer and the Creed were repositioned to the wall of the chancel. New floors were also laid to the body of the Church and Tower. Greeting : Whereas it hath been represented unto Us on the part and behalf of the Reverend Francis Goddard, Clerk, Vicar or Incumbent of the Vicarage of the Parish Church of Caverswall in the County of Stafford and Diocese of Lichfield and Charles John Welch and John Robert Stirrup the churchwardens there that the parish church of Caverswall aforesaid being in great need of restoration and repair hath been surveyed by a competent Architect by whom Plans have been prepared in which it is proposed (amongst other alterations) to put new roofs over the Nave and North and South Aisles to put new floors to the body of the Church and Tower, to form a water table and channel round the exterior of the Walls of the body of the Church, Chancel and Tower, to place new glass and lead to the windows excepting those in the Chancel and the windows now filled with stained glass, to errect a new South Porch, to provide a new heating apparatus and vault, to reseat the body of the Church throughout, to take down and remove the Gallery Pulpit and Font and to replace the Pulpit and Font in suitable positions, to restore the present Chancel Screen and to substitute an Arch in lieu thereof, to errect a Reredos at the East end of the said Chancel and generally to do all such matters and things as may be necessary to be done in carrying out the alterations and improvements as aforesaid And whereas the said Vicar and Churchwardens have duly petitioned Us to grant our Licence or Faculty to authorise and empower them to carry out the Restoration of the said Parish Church and Chancel in accordance with the Plans hereunto annexed. Know ye now therefore that We being desirous to comply with the reasonable request of the said Vicar and Churchwardens (the due forms and orders of law in this case requisite having been first had and observed) Do commit and grant this our Licence or Faculty to the effect and in manner hereinbefore prayed. Provided always that if it shall be necessary in making any of the alterations as aforesaid to remove or disturb any vaults graves tombstones or monuments due care shall be had thereof and any bodies or remains there may be found shall be decently re-interred within the churchyard of the said parish and the monuments or tombstones replaced in a suitable position. In Testimony whereof we have caused the Seal of Our Office to be hereunto affixed this ninth day of June in the year of Our Lord one thousand eight hundred and seventy-nine. List of Incumbents taken from “Staffordshire Incumbents and Parish Records (1530 – 1680)” by Landor, and “The Archdeaconry of Stoke on Trent,” by Hutchinson. St Peters Church is a Grade II Listed Building, it was first listed in 1967. The Church Wall, Piers to north and east of the Church are Grade II Listed, they were first listed in 1986. A number of Chest Tombs and Memorials in the Churchyard are also Grade II Listed structures.